It’s possible to really remove the components, might cost more though. B all the way. My SBiii hasn’t been off my wrist since buying it but B may well tempt me. I like ‘B’ also. But does anyone agree that the hour hand is a little too long as it intrudes over the numerals? I don’t think we are disagreeing. My SB3 hour hand is just at the edge of the ‘10’. In the ‘B’ it is over it. The ‘A’ version in the graphic has a shorter hour hand - like the SB3 - which I prefer. Any chance you might do a GMT version Eddie? Getting the movements at the right price is a problem. The modified ETA2836 is cheaper but apparently they can be problematic. I have to say that the SB4 render had some potential and that a Mk XVI Spitfire like homage was possible with some tweaks to the dial and hands. The Anniversary watch is for the purists but good luck with it. 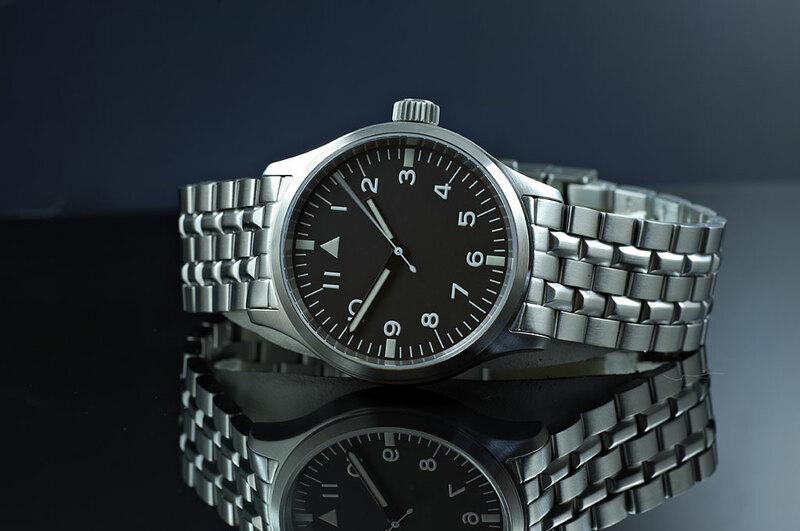 I always felt that the SBII GMT had that extra something that evoked the era of the Speedbirds; the exoticism of having to manage multiple timezones and the novelty that the extra hand brings to the face. Does this mean that you've discounted the idea of a GMT version or simply that it might be a premium price? Buy one of Eddie's Dreadnought Voyagers, all that and you can dive in it too! In stock as we speak . . .
Speedbird=simple, clean and uncluttered=no GMT. I always regretted not getting a speed bird 3, at the time I had a problem with the numbers, I wish I had bought one. I also regretted not getting a dreadnought, too slow. I will be all over version B this time. Simple and balanced, an easy everyday watch. For me what made the PRS1 was the crown, it was almost as long as it was wide, very Omega Dynamic or IWC Mk Xii. Also the long lugs gave it a rather slender feel, even though it was 11.6mm thick. The Speedbird 3 just didn't seem to look quite correct in that respect with the short crown and stubby lugs. For me the perfect Speedbird 4 would be of a similar form to the original, thin, big crown, slender lugs, 38mm dia and proper BoR bracelet. 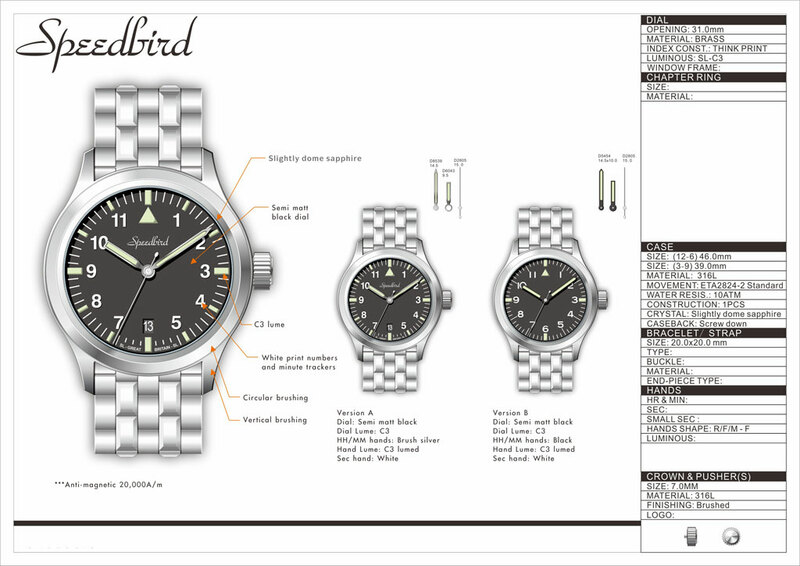 I have an older Speedbird III with the sterile dial. I've grown used to the 7 and 8 numerals, so not sure if this new release has enough changes to make me want to trade in my older model. Still love my SB III. But Speedbird is a pilot watch so a GMT feature makes sense. Couldn't agree more @MIkeP - That extra hand embodies the glamour of pilots navigating time to reach exotic destinations; if Dr Who had a watch, it would be a Speedbird GMT! Any updates on the Speedbird? There seem to be some IIIs for sale on the site. Are more IIIs going to be made, or is there going to be a SBIV, or are whatever IIIs are on sale now going to be the last of the Speedbirds? There are no Speedbirds for sale on the site but more of the Speedbird III are on order and should be here early new year (movements causing the delay). Will the next batch of the SBIII have the new adjustable clasp fitted? Thanks. Last edited by lughugger; 2nd December 2018 at 11:15. Good news, thanks! I will start the official Speedbird Fund. Fancy one of these.. Eddie any rough idea of an ETA..? 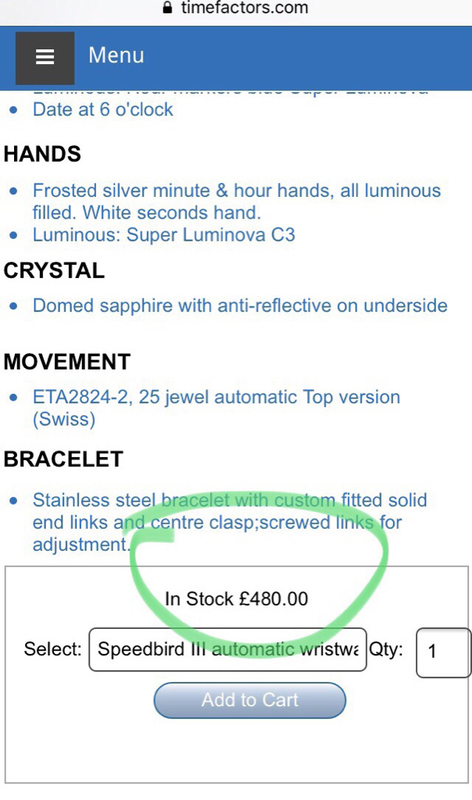 Trying to hold out, but also fancy the Everest..
On another thread Eddie posted a note from his supplier confirming shipment of a number of watches, including the PRS-22, so I suspect he'll have them when he opens again for the new year, or soon after. Is this what's going to be available later this month? That font is very a nice one. Should be, I'm taking pictures of this and the PRS-45 now. Will the bracelets have the old clasp, or the new clasp as on the 40 mm Everest? Last edited by BigBluefish; 11th January 2019 at 22:20. Somewhere in a thread there is probably an answer to this, but I for one would love a deep black dial, one which doesn't at some angles appear matt charcoal instead. I think IWC managed it on the Mk XV but I need to check old photos. It's the one thing which has made me resist getting another, several times. Amazing how a slightly different font can change the appearance so much. It looks like the new clasp to me in the first picture. It does look very nice - but I was wondering why the name disappeared from the dial? Holding on for the date version I think. Damn I was going to get the new Everest. Now? What movement is in the new batch... I think I saw something on Facebook saying it was changed from the original ETA movement? The Facebook post mentioned a Sellita SW200 "Top" movement. What’s the difference between these new models and the PRS-22 for sale on the site ? A big difference, there are none for sale on the site. None with the original ETA movement? How does the new Speedbird's lume compare to the Everest Eddie? My eyes tell me the Everest glows stronger. However, both of them are amazing watches! Will buy one of them for sure. Well just saying it sure *looks* like the one on the site is available for sale, apart from the whole Christmas-closure message if you do add it to cart. But obviously if you say there aren’t any, then there aren’t any. Did anyone order the new PRS-22 with the PRS-1 (i.e. no date) dial? Let's see some real life photos! It's OK - I can take it: Would somebody be kind enough to tell me if I'm a lone voice pleading for a GMT version of the Speedbird (I bet the SBIII would look GORGEOUS with that extra hand)? I have been looking for a GMT watch to wear every day for what seems like an age but among the many, many variants I have relentlessly researched, traveled to inspect, rejected, and nearly bought, I have not found anything that comes close to the SB GMT. 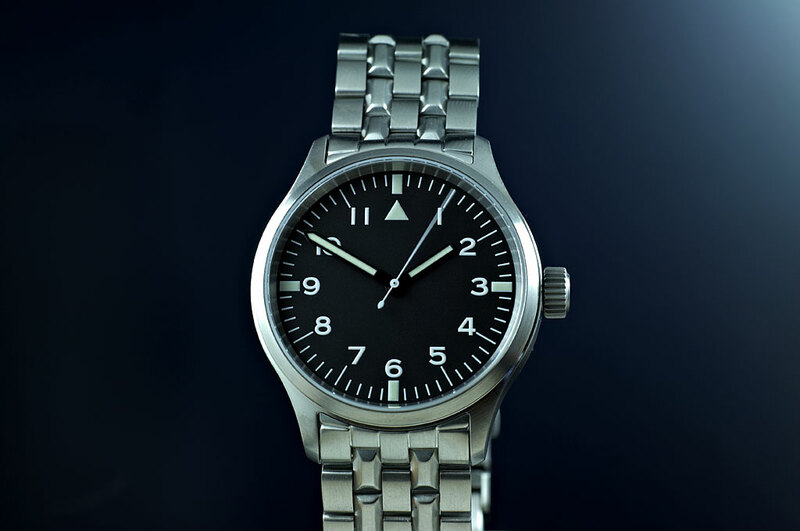 It just says "authentic pilot's watch" to me - none of the flash complexity and bewildering array of information of a Breitling or the chunky bling of a Rolex - just honest utility and an bewitching invocation of the glamour of flying to exotic time-zones in the heady days of Imperial Airways and BOAC. If my dad had been a pilot with BOAC, the SB GMT looks like the watch he would have passed down to me. Whilst it may be pure serendipity if I find an original SB GMT for sale before it's snapped-up by an equally discerning buyer, am I really alone in being prepared to pay a premium to strap a re-issued GMT version of any of the previous Speedbirds or perhaps even a SB IV GMT to my wrist? Or should I just get my coat? This took a whole 3 days to get from Eddie's to Michigan! Ah, what? I like everything about it, even the clasp. Few sharp edges I'd like to buff down a bit but it's a winner.